Please contact us directly in case you want to purchase a multi-channel tape, so that we can write an invoice for the prepayment. 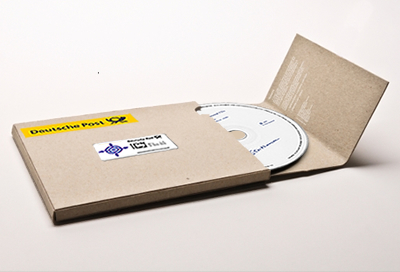 Please write to stockhausen-stiftung@t-online.de with your billing and postal address and VAT number if available. We will also ask you to sign the following agreement. The fee is for the use of the tapes for study or performances only. Recordings of any kind are prohibited. 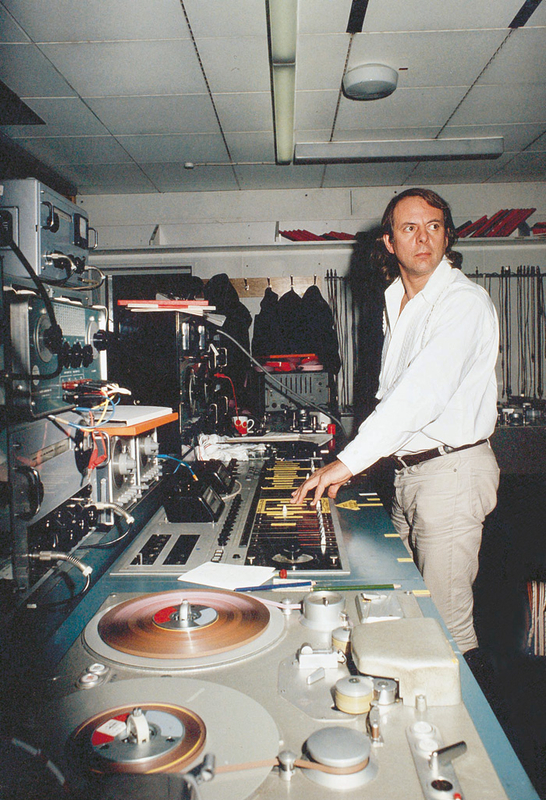 In case recordings are planned, the organizers should contact the Stockhausen Foundation ahead of time to negotiate a separate contract. Copying, exchange or multiplication, broadcasts or other uses other than for study or performances are strictly forbidden. 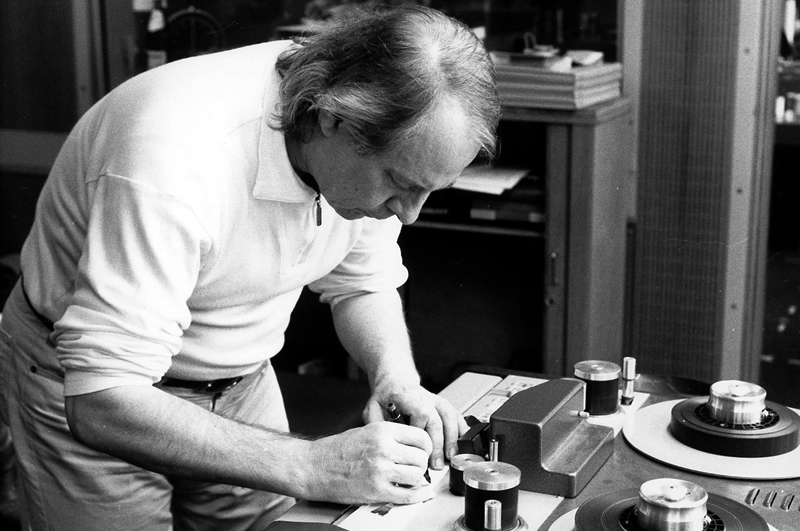 Programmes of all performances in which the tapes are used will be sent to the Stockhausen Foundation for its archives. In case programmes are not available, the exact performance date, venue, concert organizer with address will be sent to the Stockhausen Foundation. The performance is to be reported to the GEMA via the national authors’ rights society. Bänder, die vorgeführt werden können. GRUSS und ABSCHIED gemeinsam haben den Titel WELTRAUM. für Tonband, Seitenklavier, elektronische Klaviere ad lib. The inner front loudspeakers should be pointed towards the last seat at the left or right respectively in the third row of seats as illustrated in the above drawing. To do this, one person stands at that seat and another person aims the loudspeaker in that direction, without tilting it downwards. The outer front loudspeakers are pointed past the sound projectionist towards about the 3rd seat at the left or at the right respectively of the middle of the last row of seats (see drawing), without tilting it downwards. 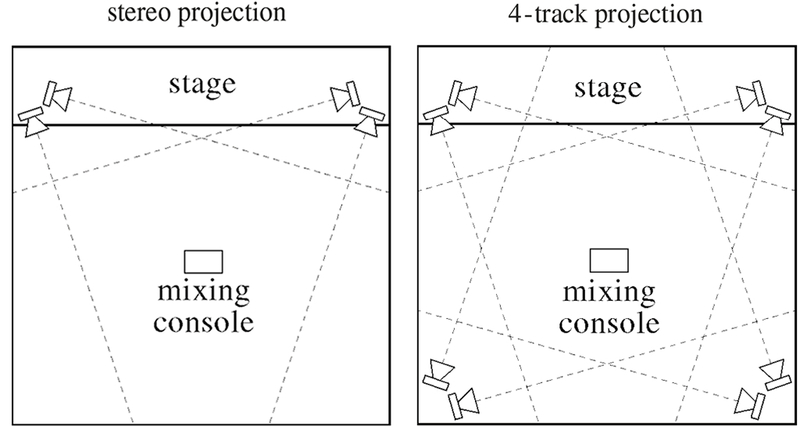 For a 4-track playback, the same applies to aiming the rear loudspeakers, but in the opposite viewing direction. This is the only way to guarantee that the sound sources reach everyone in the audience (also those seated at the sides). The loudspeakers should always be hung as high as possible or placed on high stands (at least 4,5 metres high), and not tilted downwards. The sound sources should never be aimed directly at the audience, but rather the sound should also reach the audience indirectly through the reflections on the walls. That is the only way to project a full sound which, however, never hurts the ears of the listeners. The woofers (1 bass loudspeaker per group) may be positioned on the floor beneath their 2 tweeters and it must be possible to regulate their volumes separately. The sound projectionist always needs a second person who, during the rehearsal, sits down on as many seats as possible in different places in the hall (especially those nearest to the loudspeaker positions) to assess if the sound is balanced everywhere and never too loud (possibly seats will have to be blocked). For aiming the loudspeakers in an octophonic set-up, the loudspeakers in the upper square – if they really can be hung very high (ca. 12–14 metres) – are tilted slightly downwards, and their levels are set ca. 5 dB louder than the lower tracks 1–4 (with a group fader for tracks 5–8). Only by doing this can the vertical movements of the sounds be clearly heard. This applies therefore to the works OKTOPHONIE and MITTWOCHS-ABSCHIED. Otherwise, the upper square of loudspeakers is aimed in the same way as the lower square, as described above (see drawing). © 2013 Stockhausen-Verlag, all rights reserved.